Download Ghost Recon Network for Android with APK file. It is a free app for Android and it is app mate off Ghost Recon: Future Soldier. It gives the facility to customize and set the weapons before going to the battle. It is proudly developed by Ubisoft, a well known organization. Ghost Recon Network is basically an addition app to the Ghost Recon: Future Soldier. It is very similar app to the Gun smith arena in the original game. It allows you to customize your all weapons and its parts like; triggers, attachments, magazines and many other attachments. Then you can see the output of weapon too. You have to connect with Ghost Recon: Future Soldier with your Uplay account before connecting Ghost Recon Network. Once you connected with original game and Uplay account then you can connect it with Ghost Recon Network and manage synchronization changes in app with your game. You can set your military unit and multiplayer mode too. 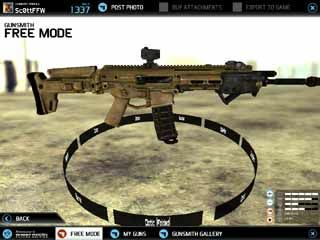 This is free app for Android, so allows you to customize 40 different weapons from little weapon to heavy weapon like pistol to every type of rifles. Ghost Recon Network became very famous after its released and working well on all Android tablets and phone devices. However it may take some time to load weapons to be customized, but still has a lot of attraction to use this app. It bring a lot of freshness in game and newness in weapons which gives you a lot of fun to play and fight the battle in this action and arcade game.